The Malmo Tallboy echoes the gorgeous modern Resort-style inspired design of its timber bed frame counterpart. 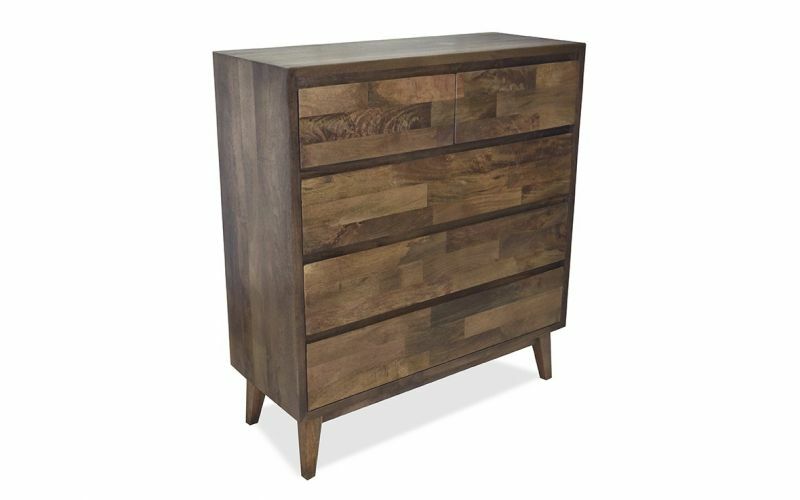 This tallboy flaunts a gorgeous timber wood grain and uses a recessed handles for added style. With five spacious and easy sliding drawers, this tallboy offers a stylish storage space for your clothing, personal effects and other knick-knacks for a clean, clutter free room. The tallboy is then supported by slanted tapered legs that completes its premium signature look. This tallboy is finely crafted using solid Mango wood - a beautiful, hardwearing material. With its easy sliding drawers, premium quality craftsmanship and materials, this tallboy presents a strong and durable tallboy that makes a perfect bedroom investment that lasts.